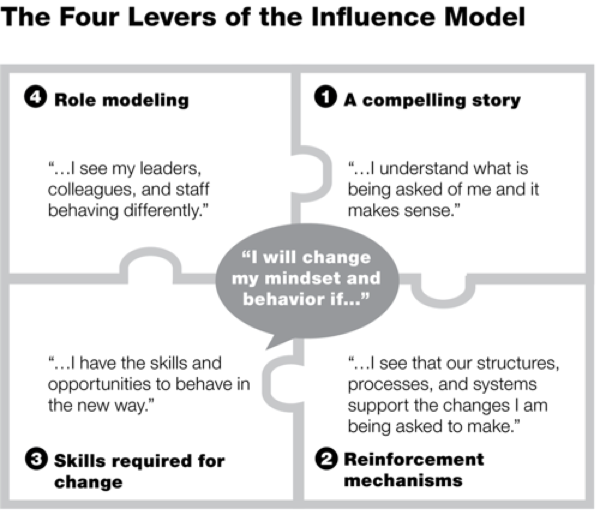 Change initiatives might be well defined, rightly prioritized, and their organizational impact perfectly understood, but without a compelling vision and an inclusive approach, mindsets will not change, and these initiatives will never get successfully deployed throughout the organization. A compelling story: to be adopted, the change has to be understood and make sense for everyone impacted. Reinforcement mechanisms: a clear message has to come from the organization as to the importance of the change; it has to be supported by tangible and visible efforts in terms of management, support, visibility, etc. Skills and competency: for an organization to change, every participant has to change, and for anyone to change, learning and development, post-implementation support, etc. have to be available. Role modeling: ultimately, the exemplar behavior of both management and valued peers will amplify the message and thus, broaden the base. Change is a movement! Source: Keller, Scott, and Price, Collin, McKinsey & Company, 2011, Beyond Performance: How Great Organizations Build Ultimate Competitive Advantage. Hoboken. John Wiley & Sons.